The ability to form persistent seed banks might contribute substantially to determine the invasion potential of alien plants in their new distribution ranges, given the role of seed banks as sources of propagules, genetic diversity, and in spreading the risk of germination failure over time. Using the largest seed bank dataset collated to date, comprising 14,293 records for 2566 species, we examined whether the type (transient vs persistent) and density of the seed banks of invasive species differ in their native (home) and alien (abroad) range, and whether these attributes differ among invasive and non-invasive congeners, at home and abroad. A lower probability of forming a persistent seed bank in the alien range was identified when analyzing data for 140 invasive species, although phylogenetic analyses run for 104 of those species did not confirm such differences. However, invasive woody species formed denser seed banks in the alien range, suggesting greater seed production and/or lower seed predation or mortality in the alien than native range. Interestingly, invasive species consistently showed a higher probability of forming persistent seed banks as well as denser seed banks than their non-invasive congeners in their native range, but not in their alien range. These findings provide the first quantitative evidence, based on a large number of species globally, of preadaptation with respect to species life-history traits resulting in the formation of a persistent seed bank in invasive species compared to their non-invasive congeners. 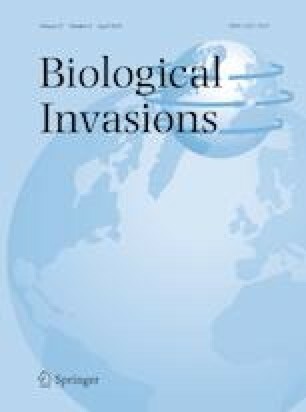 The fact that both invasive and non-invasive congeners have similar probabilities of forming persistent seed banks abroad suggests that this might be an important attribute for the establishment of alien species in new ranges (naturalization phase), but not for their spread (invasion phase). Our findings also indicate that the characteristics of native seed banks should be an important component of risk assessments aimed at identifying species that are more likely to become invasive if introduced in new ranges. The online version of this article ( https://doi.org/10.1007/s10530-019-01978-y) contains supplementary material, which is available to authorized users. We are grateful to all the authors of the papers that provided additional information on their studies. In particular we thank Scott Abella, Alistair Auffret, Karen Esler, Mirijam Gaertner, Tanja Mason, Noelia González-Muñoz, Joe Greet, Ileana Herrera, Patricia Holmes, Hélia Marchante, Bruce Osborne, and Farai Tererai for providing the original data underlying their studies. We would like to thank two anonymous referees for constructive comments on a previous version of this manuscript. MG, LM and PP were funded by Projects No. 15-13491S, 19-20405S and EXPRO Grant No. 19-28807X (Czech Science Foundation), and long-term research development Project RVO 67985939 (Czech Academy of Sciences). PP acknowledges support of a Praemium Academiae award from the Czech Academy of Sciences. JLR acknowledges funding from South Africa’s National Research Foundation (NRF grant no. 9117).